Virgin Holidays encourages people to discover new places, people, sights, scents, flavours, fun, and more in its latest ad, titled “The World Is Your Playground”. Created by the agency AMV BBDO and directed by Danta Ariola through MJZ, the ad includes lots of fantastic and surreal elements juxtaposed with real places, such as the Big Sur, Las Vegas and San Francisco Bay. Thus, a man is seen riding a vintage muscle car down the Big Sur as if it were a skateboard, the Las Vegas strip is seen placed within a pinball machine and giant paper boats are seen floating in San Francisco Bay. 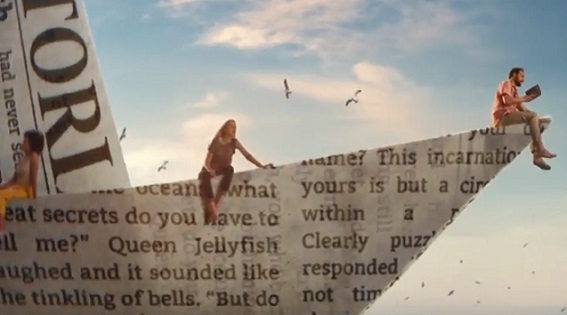 Children swinging in mid-air, above the clouds, with the Disney castle and fireworks in the background, a couple in a sub-marine that it turns out is in a glass of water, a couple riding carousel horses above the sea, near an exotic beach, are also featured throughout the ad, which ends with the tagline “The World Is Your Playground” flashing across the screen. The soundtrack music is Andy Williams’ version of the popular song “When You’re Smiling”, written in 1928 by Larry Shay, Mark Fisher and Joe Goodwin. His recording is included on his 1963 album “Days of Wine and Roses and Other TV Requests”. The song has also been recorded by Seger Ellis in 1928, Louis Armstrong, in 1929, Ted Wallace & His Campus Boys, in 1930, Dean Martin, in 1952, Ella Fitzgerald, in 1958, Michael Bublé, in 2001, Rufus Wainwright, in 2007, and more. “The World Is Your Playground” TV advert premiered during “The X Factor” on ITV on Saturday, 15 September 2018, simultaneously with an ad promoting Virgin Atlantic, titled “Depart the Everyday”.